Bursting with natural goodness and subtle enough to be used in smoothies, this warming spice combo is also great for cooking. Try it in a curry. For centuries, Ayurvedic practitioners have used turmeric and black pepper for their healing powers. Now, we’ve combined them with cold-­‐pressed coconut to create a naturally gluten-­‐ free cooking oil that’s specifically designed for healthy recipes. Our range of raw, handmade oils are all based on premium organic coconuts. Because we only work with farmers who share our ethical values, the products are not only 100% natural but also eco-­‐friendly and sustainable. Please note that this particular variety of flavoured oil is not recommended for beauty treatments, as the turmeric may stain your skin and clothes. If you’d like to make your face, body and hair gorgeously soft and fragrant, try our organic king coconut oil, our natural organic virgin coconut oil or our sweet-­‐smelling organic virgin coconut oil with vanilla. Contains negligible amounts of protein, carbohydrate, sugar, fibre and salt. 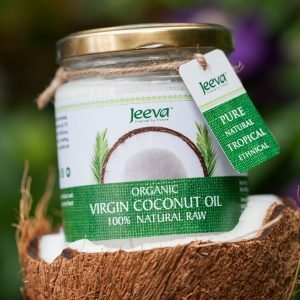 Inspired by Ayurveda: Jeeva premium coconut oil is made from the milk of freshly harvested handpicked coconuts. 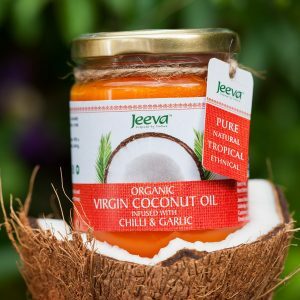 Jeeva means ‘full of life’ and there’s a definite kick to this lively Ayurvedic spice blend. Try it in stir-­‐fries, on your roast potatoes or as an invigorating breakfast spread. 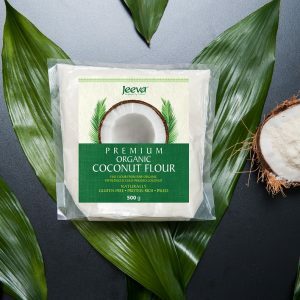 This fine flour, produced from raw, organic, fat-­‐reduced, cold-­‐pressed coconuts is a pantry essential for allergy-­‐friendly special diets cooking and baking. 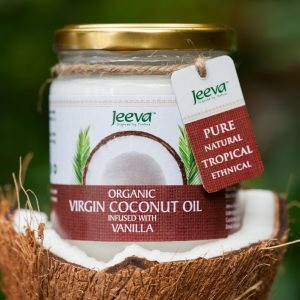 Jeeva is an ethically-aware company that prides itself to bring 100% pure premium range of products like 100% Natural & Organic King Coconut Water, Extra Virgin Raw king Coconut Oil and rare & premium Bamboo Blossom Rice.